Efficiency rating of 80% AFUE can save you hundreds of dollars each year** compared to standard furnaces. Power Saver™ constant torque motor adjusts airspeed based on demand, helping the furnace use less energy in heating and cooling modes. Power Saver technology not only provides energy boost capabilities improving the overall system efficiency, similar to a variable speed furnace, but also delivers higher system SEER ratings. 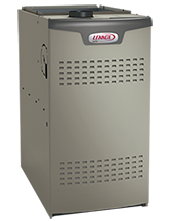 Efficiency rating of 80% AFUE—can save you hundreds of dollars each year* compared to standard furnaces. *Lennox’ SL97UH40NV36B, EL195UH100NE60C, SL280UH100NV60C, and EL180UH040NE36A units are the first commercially available natural Gas-Fired Fan type Central Furnaces to meet a NOx emission limit of 14 nanograms per Joule (ng/J). **This chart depicts potential energy savings you can expect from the EL180E furnace, versus older furnaces with lower efficiency ratings. Criteria used in this example are 2,000 full-load heating hours, with a 60,000 Btuh heating design load and $1.368 ccf for gas. Your actual savings may vary, depending on the weather patterns in your local area, local fuel rates and your individual lifestyle. © Copyright 2016 by Midway Sheet Metal. All Rights Reserved.